The soundboard for my design of lattice guitar is between 1.0mm and 1.3mm thick. I find the traditional mechanical caliper difficult to read accurately when working to these extremely thin measurements. A digital readout measuring tool is more accurate, and best of all is the MagicProbe or similar device, as extremely accurate readings can be obtained. This rosette is made from decorative burr veneers, arranged so that they radiate out from a central point. They are temporarily taped together with veneer tape, before being glued to another single sheet of veneer which stabilises them into one unit. This can now be cut with the circle cutter into a single rosette ring to inlay in one piece. Finally a decorative border is inlaid around the inner and outer circumferences. Mark out the positions of the 12th fret, the width of the neck at the 12th fret and draw the plantilla so that the entire soundboard outline shape is established. 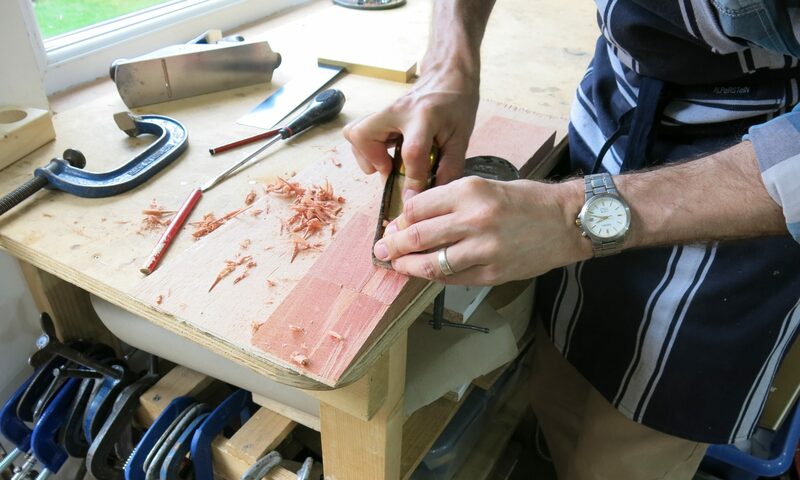 Once the rosette is complete and the spruce surface smoothed and sealed with shellac, the soundboard is turned over and planed, scraped and sanded smooth, finishing at between 1.0mm and 1.3mm, the thicker dimension being around the periphery. Great care must be taken as the soundboard approaches these dimensions as it is very fragile. The ‘box’ sections created by the lattice are 37mm to 40mm square. A typical size guitar will need nine struts each way, making 18 in all. But a smaller guitar like a Torres shape, may only need eight each way.